Let It Ride by John McFetridge, a Mysterious Review. 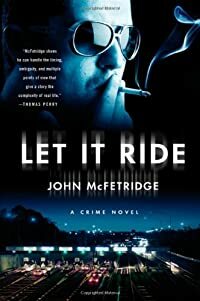 Review: Crime and criminals north of the border are the subjects of a twisted caper-style plot in Let It Ride, a stand-alone thriller by John McFetridge. Former Armed Forces Sergeant Vernard "Get" McGetty travels from Detroit to Toronto to meet with the leader of the Saints of Hall in an effort to expand his network of illicit cocaine trafficking. But another opporunity — possibly far more lucrative — presents itself when he meets up with Sunitha Suraiya, who has plans to take on the Saints for what are believed to be millions in gold bullion they have in their possession. Separately, Toronto cops Maureen McKeon and her partner Andre Price are trailing them, albeit on a completely separate path, that starts with the seemingly random shooting of a husband and wife in their car while they were on their way home. Let It Ride isn't so much convoluted — which, to be sure, it is — as it is cluttered. In the first chapter alone, stories are told from four points of view (though, to be honest, it isn't obvious why one is called "Price and McKeon" and another "McKeon and Price", so maybe they shouldn't be counted as two); another three are introduced in the second chapter, with a half-a-dozen or so more popping up in later chapters. The primary plotline is rather interesting, and could have been compelling, but there's so much going on from each character's perspective that, at times, it's hard to stay engaged. The author is clearly taking an unusual stylistic noir-ish approach to the narrative here; for some it may appear to be innovative or exciting, but for many readers, it's likely to get very tedious very quickly and be something of a chore to complete, hardly the feature of a recommended novel. Acknowledgment: Minotaur Books provided a copy of Let It Ride for this review.